Business bag for your laptop features an expandable interior compartment, that converts it from a medium-sized to a large bag. The contrasting-color pouch, a versatile accessory for the entire Work Out 3 collection, can be used in three different ways: totally hidden, partially visible, or completely pulled out to expand capacity. 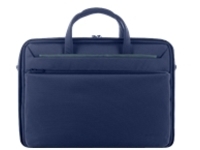 Offers a detachable shoulder strap and interior compartment with anti-shock system to protect your laptop.